WASHINGTON (Reuters) - President Donald Trump has invited Russian President Vladimir Putin to Washington this autumn, the White House said on Thursday, a daring rebuttal to the torrent of criticism in the United States over Trump's failure to publicly confront Putin at their first summit for Moscow's meddling in the 2016 election. What happened at Monday's one-on-one between Trump and Putin with only interpreters present remained a mystery, even to top officials and U.S. lawmakers who said they had not been briefed. With Trump under fierce criticism in the United States, the White House on Thursday rejected Putin's proposal that Russian authorities be present for the questioning of Americans it accuses of "illegal activities," including a former U.S. ambassador to Moscow. 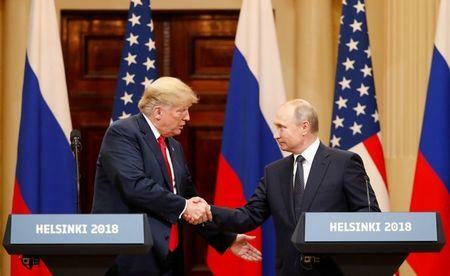 Republican and Democratic U.S. lawmakers grappled with Trump's conflicting statements as they discussed ways to show their opposition to what they saw in Helsinki, including strengthening sanctions. Sanders on Thursday said, "It is a proposal that was made in sincerity by President Putin, but President Trump disagrees with it," a day after saying the proposal was going to be discussed by Trump's team. "Hopefully President Putin will have the 12 identified Russians come to the United States to prove their innocence or guilt."